Armorama :: Jeep, etc. Campaign? In. Maybe breaking open a new kit will get me back into the building mood. Let's see Mini Art's 1/35 Bantam or Auska's 1/24 Bantam. Rules and Signing : HERE !!! Armyguy, and anyone else for that matter, if you go 1/24th you might consider LSA's range of accessories. Do not leave your mind so open your brains fall out. Happy to see the campaign confirmed. I'm IN and enlisted today ! Sounds like, unless you actually want to carefully define this campaign as being "JEEPS only".... meaning the US - built 1/4 ton truck 4x4 Ford and Willy's GP of WWII and it's post-WWII successors M-38 up through the M151 MUTT, you'll want to create a list to at least vaguely bound the "light type" allowed! "FYI": The "Jeep" was a light utility truck. It served exactly the same roles in WWII as did the German VW kubelwagen, Horch type 1a, 108, and 901, Steyr 1500A, Steuer types, and MB 1500A, as well as various coopted cars. The VW kubel, Horch, Steyr, and MB types were all technically defined by the Germans as "personnel cars" (light, medium, and heavy classes), and not as "trucks". I know. It's a technicality! The Steyr and MB "cars" were actually TRUCKS with different bodies (sounds like US school-bus versus parent truck chassis, to me!) . Keeping it to "JEEPS" specifically is narrow but keeps things simple. Allowing in the "similar-use stuff" - from Brit Austin "Tilly" to Russian GAZ 67B and 69B series and their modern analogs, will broaden things hugely.... but does complicate setting bounds. Gross vehicle weight under 4500 lbs, maybe? Kubel wagens, VW cars, MB 170 military types and similar "militarized passenger cars", GAZ 67B variants, the Kurogame versions, FIAT Coloniale 508 and Topolino versions, French Simca, schwimmwagens, GP amphibians, Willy's Bantam, the Austin Tilly... Several modern-era light field cars could jump in (M151 Mutt variants, Israeli 151 knock-offs, Chinese PL1 variants, Russian GAZ 69 variants, CJ-3 and CJ-5, M-38, Land Rover SWB, Land Cruiser FJ40, similar other types)... Heck! At "under 4500 lbs", the modern Steyr Pinzgauer 710m cargo and personnel truck would edge in! I THINK that all of those German Horch, Steyr1500A and MB1500A types were heavier than the "4500 limit". Even an actual JEEP kit! Thanks for the analysis! I'd like to keep it open to more than just "Jeeps" but not too open. I've added the 2t/4500lb limit to the rules. Your list looks like a good one but, of course, I'm open to other vehicles that are under the weight limit. Just one question : any aftermarket parts allow (like conversion set or add on)? That all sounds good by me! Welcome! Jeff T hows it going. The last Jeep campaign was my 1st campaign on here, and I think you were involved too Jeff. Looking forward to it. I have an Italeri Jeep with stretchers and I am thinking Paras. A wee dio. Thanks Michael .. I'm in ..
Don't know what to build yet... maybe a German vehicle? My last was the DRAGON "Battle of the Bulge" kit which I believe was a Hasegawa rebox. BUT, we have time until November, huh! LOL Jeff I knew you were involved, my apologies for not remembering you were the leader. And you did a fine job my friend. 25% started...? What would that be in practice? If body is done, would that be inside rules? Just curious because I have two Bronco Jeep's WIP. I'll join up for this one. I have an MPC 1/24 scale jeep that I want to do as a M38(slick) recoiless rifle jeep. I love the old companies reissuing these kits from my childhood. This kit was one of first I ever built as a kid and the tires languished in my spare parts for decades. I guess I'd have to see what you mean. Honestly I add the 25% rule to get more people involved. I know I'll start a kit and then get distracted, and I thought allowing partially started kits would attract more enlistees and lead to more completed builds. It's sort of an honor system on how much YOU think your kit is done. After all, the idea is to have fun! So, the reason I proposed this campaign is that I want to build one of these. Question is, which one? What do you all think? My local Hobby Lobby always has this 1/14 scale Jeep in stock, and at 40% off, why in the heck not!!!! I'm in and really excited about this one! I am interested in this? Can you please share any details about it, like... do you have a picture and do they have more than one? What's the difference as I am no expert in the SAS JEEPS. One is configured as used by the Special Air Service in N. Africa, the other by the SAS in NW Europe after the invasion. 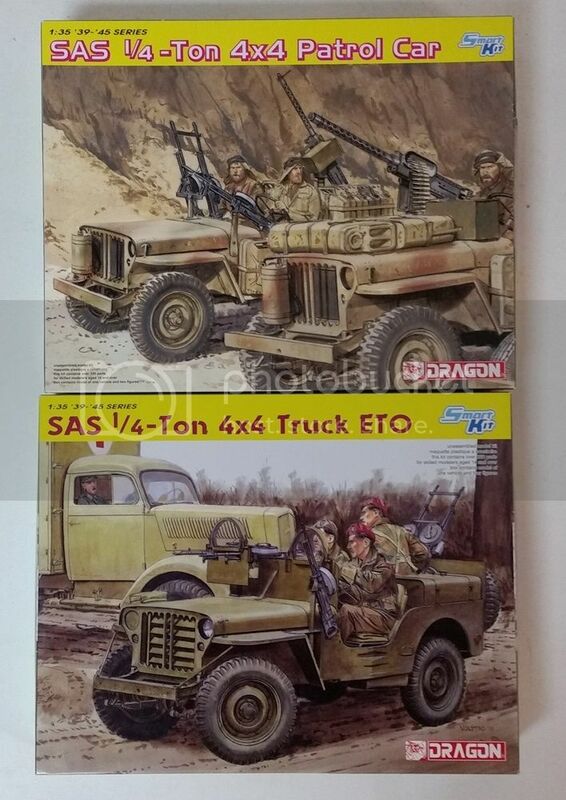 Just saw a posting about Soga Minatures releasing a 2 figure SAS set for the Dragon SAS jeep. Ah, Rat Patrol. That was great television!